At best, quitting smoking is hard! Many millions try to stop each year, only to return to their old addiction. Enter: Premium Vapors. This new local business is dedicated to helping those who truly desire to quit by offering personalized service for those new to the e-cigarette world as well as those who have already transitioned over. 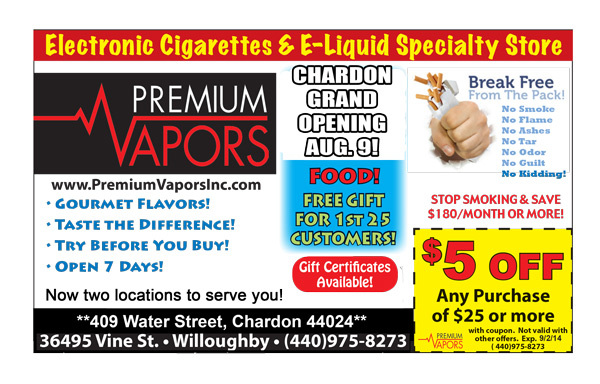 Premium Vapors is pleased to announce its Grand Opening at a second location on August 9, 2014, at 11:00 a.m. at 409 Water St. in beautiful Chardon. We specialize exclusively in offering the best e-cigarettes, e-liquids, and a wide range of accessories. We are proud to be the first specialty store of this kind in our area. We understand that this is a new market and customers have questions due to the overwhelming variety of e-cigarette products. We want to educate people by making the distinction between the flood of disposable e-cigarettes and our high quality brands. Premium Vapors provides personal service customized for the newcomer or the experienced “vaper.” This is a personal product that differs from person to person depending on their habits and lifestyle. Not everyone can quit smoking “cold turkey,” and smokers have told us how e-cigarettes have changed their lives, never looking back to the unpleasant tobacco taste. E-cigarettes contain no tobacco, no tar or strong smell and come without the guilt! The electronic cigarette is a hand-held device that holds a nicotine flavored liquid for improved smoking pleasure. At Premium Vapors, we have a living room atmosphere with a free tasting bar of many tantalizing natural flavors. Enjoy such flavors as Watermelon Freeze, Biscotti, Windstone or Kahlua. All flavors are available in nicotine levels of 0,6,12,18 and 24mg. Our premium flavors (vapors) “try before you buy” advantage makes all the difference that cannot be done with online shopping. Adults finally have a realistic alternative to an age-old addiction. The last innovative product was the cigarette filter in 1952! This is why we welcome you to Premium Vapors in Chardon. See why our e-cigarettes are a safer, smarter way to go than the traditional Marlboro or Newport cigarette. You’ll save money, breathe easier, and love the freedom it gives back to your life! We also offer gift certificates for those who don’t smoke, but want to buy a special gift for their loved ones who do.